There are 2 aspects of this study that make it interesting and pertinent. It uses FE (finite element) spine modeling and live patient analysis. It doesn’t attempt to assess the “clinical outcome” of spinal traction (it appears the authors assume it works effectively). They assess the ‘strain’ on the structures during axial traction (1/3rd BW) then a re-assessment upon a “local”, intersegmental P-A pressure. This ‘local’ extension equaled approx. 7-8mm. The premise is that axial tension can ‘strain-load’ the posterior disc fibers (especially true in moderate degeneration) and this can result in further injury…certainly not always or in everyone but it is a consideration. By adding a slight inward pressure at the L5/L 4, L5/S1 level the annular strain was dissipated without adversely affecting intradiscal pressure. 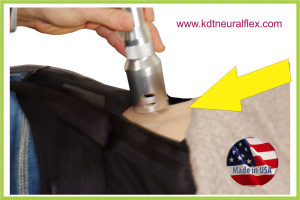 The “open” Versa-belt was designed to allow time savings with Laser (or any modality) during traction as well as allowing this hands-on, manual ‘interface’. I have always been dumbfounded by the use of excessive forces & motions during typical F/D treatments (and I am well aware I have injured many patients overdoing it). This study gives some real information on the actual depth of additional intersegmental motion that may actually be needed as well as the FE assessment that the posterior disc fibers stand to be ‘over-strained’ in many cases if more than 1/3rd BW is imposed. The Slump test, first described by Geoff Maitland PT some 40 years ago is used to elicit “sciatic” symptoms or pain radiating from the sciatic nerve or lumbar nerve roots. There are several forms or variations all meant to tense and thereby ‘irritate’ the lumbar nerve roots. The patient sits on a bench that allows there feet to hang without touching the floor. As with other neuro-mechanical tension tests a progressive application of movements and tensioning are added to elicit pain. The patient slumps forward and the painful leg is raised (the foot can be dorsi-flexed preliminarily or after the addition of further leg extension) then further neck flexion is added to fully ‘tense’ the nerves. A positive finding is reproduction of pain. The positive test may suggest the patient is a candidate for flossing procedures…either seated or lying. If neck flexion doesn’t create pain then the sciatic nerve is not the structure of interest. If extension of the skull (while maintaining the various provoking positions) dramatically improves the pain it is assumed nerve tension may indeed be a source of pain. Can apparent changes in muscle extensibility with regular stretching be explained by changes in tolerance to stretch? This study is one of several which over the last decade have given fuel to the fire that stretching doesn’t really make muscles “longer”. Recent studies have also concluded stretching (static) can have a negative effect on activities requiring power such as vertical leap, sprints and weight lifting. The authors used 20 participants each performing 20 minutes of hamstring stretches 5 days a week for four weeks. Exact measures of control vs. stretched limb were used regarding torque and subjective tolerance-to-stretch. The conclusions were very interesting in that no objective measures could show an actual increase in muscle length per se or muscle extensibility. What did change or improve was the subjects’ tolerance-to-stretch; this increase in tolerated stretch was matched by the increase in torque tolerated; 12 Nm. Additionally these findings matched several other studies in terms of degree of “increased stretch/tolerance” (~8 degrees) however some of the previous studies used much less time and effort than the 20 minute 5x per week of this study. An “increase” in straight leg motion should be assumed to about 5-10 degrees with a dedicated hamstring stretching routine over 4 weeks but the maintenance of this “increase” is likely lost rapidly without continued application. https://kdttechnique.com/wp-content/uploads/sites/4/2018/07/kdt-logo.png 0 0 Lori Klink https://kdttechnique.com/wp-content/uploads/sites/4/2018/07/kdt-logo.png Lori Klink2015-10-08 14:15:452015-10-08 14:15:45Can apparent changes in muscle extensibility with regular stretching be explained by changes in tolerance to stretch? Effect of combining traction and vibration on back muscles, heart rate and blood pressure. Wang L1, Zhao M1, Ma J1, Tian S1, Xiang P1, Yao W2, Fan Y3. Traction and vibration are commonly used to relieve LBP. The effect of combining traction and vibration on back muscles, heart rate (HR) and blood pressure (BP) was investigated. Supine traction of varying angles with vibration were combined (0°, 10°, 20° and 30°) (0 Hz, 2 Hz and 12 Hz). The combination of traction and vibration (from 2 Hz vibration along Z-axis and up to 12 Hz vibration along Y-axis) had no significant effect on the cardio-vascular system. The activity of lumbar erector spinae (LES) and upper trapezius (UT) decreased significantly when the angle reached 20° under the condition of 2 Hz vibration along Z-axis compared with it of 0°. Furthermore, the MPF also decreased significantly compared to static mode at 20° for LES and at 30° for UT. However at 12 Hz vibration along Y-axis, we recorded significant increase at 20° and 30° compared to 0°. For LES, the MPF also had significant difference when the angle was increased from 10° to 20°. Comment: This study gives us some insight into a few aspects of traction we promote. It validates traction with vibration is not a problem to the cardiovascular system. Additionally muscle activity is diminished generally however at steeper angles (inversion devices) and high-Hz vibration, muscle activity may actually increase. Vibration-plate users recognize this…high levels create increased muscle activity. Additionally the steeper the “inversion” angles the more muscle activity. This suggests moderate inversion and lighter vibration are preferred for pain relief. https://kdttechnique.com/wp-content/uploads/sites/4/2018/07/kdt-logo.png 0 0 Lori Klink https://kdttechnique.com/wp-content/uploads/sites/4/2018/07/kdt-logo.png Lori Klink2015-10-06 16:08:252015-10-06 16:08:25Effect of combining traction and vibration on back muscles, heart rate and blood pressure.